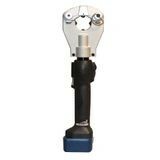 6.2 TON STREAMLINE DIELESS CRIMPING TOOL | Tallman Equipment Co., Inc. The SL-750 is a flip-top, dieless tool used to crimp cables up to 750 MCM. The flip top latch opens to allow for easy cable positioning and removal. The dieless system is used for non-tension splices and terminations. There is one stationary and three movable indenting nibs which close at 90° angles to each other so that the connector is squeezed equally at four strategic points with 6 tons of force. The top can be unlatched to accommodate larger size lugs and cables up to 750 MCM. Typical applications include in-line splicing connectors and lug terminations. ; NOTE: This tool is designed to crimp Anderson Style connectors. Other brand connectors manufactured to ANSI specifications C119.4 can be used. For rangetaking connectors, the cable must be maximum size specified for the connector. Consult your connector manufacturer for dieless applications.